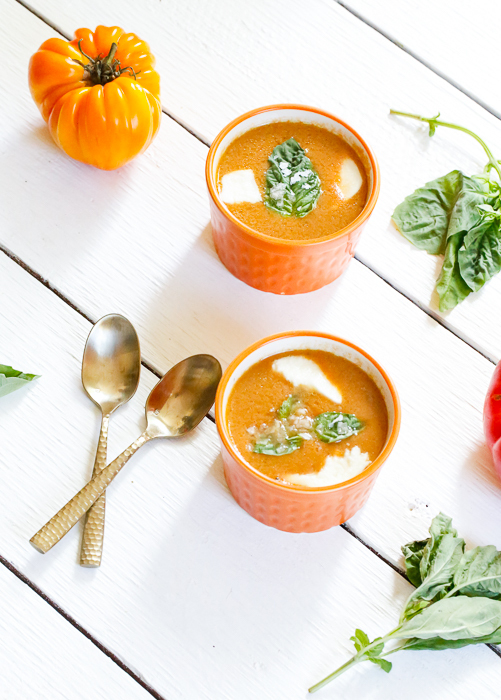 Easy, Breezy, Gazpacho — Welcome to Fitty Foodlicious! My easy, breezy, delicious, Gazpacho will light up your senses and be a refreshing hit at the dinner table! It’s wonderful for those warmer fall days and it great for using up those excess veggies on the counter. This Gazpacho also freezes well so make a big batch and store in the freezer to enjoy later! Yesterday was the first day of Fall Equinox, but by the warm weather you would never know. It feels like summer is sticking around here in California and that’s why my Gazpacho recipe is a wonderful treat on a warm day or can even be warmed up and eaten on a cool fall evening. There is actually funny story behind this recipe which I will get into later in this post. First, let’s talk about fall. We celebrate fall big time in our house and I cannot to wait to go even bigger when we have children. I decorate our front yard with countless pumpkins from our farm (it drives my hubby crazy). I go full out autumn mode around here after the first day of fall equinox. I take hay bails and pick up mums from Trader Joe’s and take giant corn husks and decorate both of our doors with them. Inside my house, I fill tall glass jars with popcorn kernels and mini pumpkins and this year I’m going to make my own pumpkin plant hangers. Fall is a huge deal around here! It’s as if orange explodes all over my house! I love what fall offers. New beginning’s, a fresh start, pumpkins, yummy recipes, good books, cool nights, movies like Hocus Pocus and You’ve Got Mail, and endless cups of pumpkin coffee. One of my favorite quotes is: “I love living in a world where there are Octobers” and October is almost here which also means libra season for me. This time of year is filled with magic and endless possibilities! Back to that funny story…So I was in my kitchen a couple of weeks ago wanting to make veggie juice. I hopped on Instagram and thought I’d be all cool and show everyone how to juice using Vitamix or high-powered blender. Just wait, it gets worse. So here I am loading up my blender on stories, acting like a badass, using every single possibly veggie in sight. I blend the veggies for 10-minutes and try adding more water and so on and so on, and I still end up with a fiber mess of vegetables, basically soup. I even tried watching youtube videos of how to make juice using a Vitamix and I found this one hilarious video of a woman using weights and cement blocks to pull the fiber out of the veggies after using her Vitamix to blend the juice. It’s really funny and if you get a moment you should go watch it, because she really believes in her way and I adore her enthusiasm! All that work, when inevitably buying a juicer is easier. I do commend her though for her creativity. Long story short, using a Vitamix for juicing the veggies I was juicing didn’t work so instead I turned my failed recipe into a triumph! I turned my “juice” into delicious Gazpacho which is actually super quick and easy to make. You can use any veggies you want, but the main ingredient in this Gazpacho is tomatoes. Feel free to use tomatoes as the base and go from there. Get creative with it! This Gazpacho is wonderful if you have a bunch of veggies that you need to use up quickly. Want a warm soup instead? Easy! Warm it up on the stove top and add flaky sea-salt and fresh mozzarella like I did. 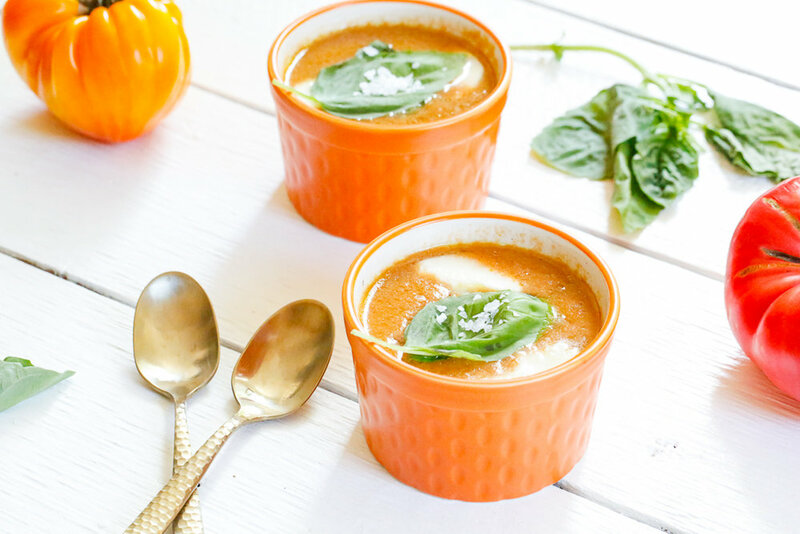 This gazpacho is delicious, refreshing, and tastes really good! Sometimes I get lucky and my failed recipes turn into triumphs! What about you guys? What recipes that you thought were a fail, ended up turning into gold? Comment below and let me know. If you make this and my other recipes, don’t forget to tag me on Instagram @fittyfoodlicious and use the hashtag #fittyfoodlicious I love seeing my recipes in your kitchen! Happy Fall friends! Let’s make this autumnal equinox the best one yet! My easy, breezy, delicious, Gazpacho will light up your senses and be a refreshing hit at the dinner table! It’s wonderful for those warmer fall days and it's great for using up those excess veggies on the counter. This Gazpacho also freezes well so make a big batch and store in the freezer to enjoy later! A few sprigs of fresh basil, cilantro, and flakey sea-salt for garnish. Make sure you have a strong blender. Place all of the ingredients in the blender and blend on high for 5-10 minutes or until smooth. You may need to add more liquid for desired smoothness. 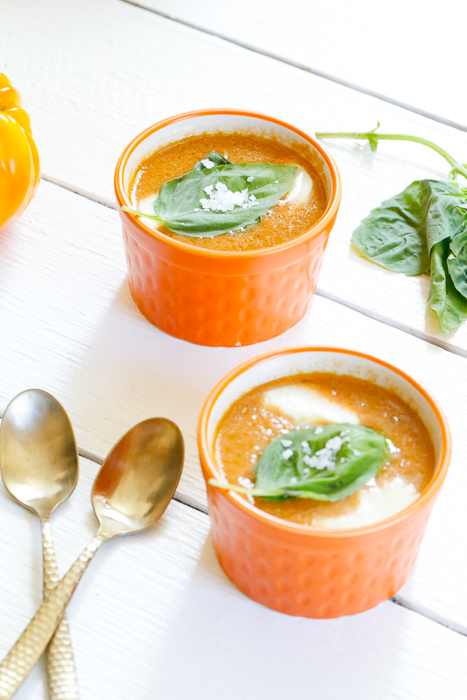 Pour Gazpacho into ramekins or bowls and garnish with fresh basil, cilantro, mozzarella, and flakey sea-salt. If you prefer your soup warm, make the soup in a blender, and then heat it up in soup pan on the stovetop.